TASTE: As the nose implies, the malt takes center stage with a nice, sweet molasses/caramel rush up front. The middle has a slightly vinous, fruity flavor followed by a baked bread/nut finish. Neither too bold nor too bland. DRINKABILITY: This is an absolute session beer. As drinkable in the dead of winter as it is in the dog days of summer. Refreshing but full-flavored and with that nice, nutty flavor profile setting it apart from the rest of the low-ABV Brown Ale pack. 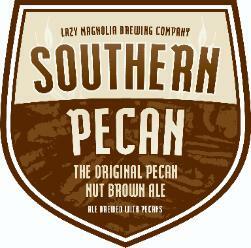 Posted in Tasting Notes.Tagged Alys Beach, Brown Ale, Lazy Magnolia, Slouch Sixpack, Southern Pecan. I’m such a huge fan of this beer and seek it out whenever I’m travelling through the South. Never had anything like it. Per your suggestion, the Commander and I had this whilst vacationing on the gulf coast (as some of you may already know, the Gulf Coast was once where people congregated on pristine beaches to enjoy oil-free ocean). The pecan is there, but doesn’t overwhelm the brew. It’s incorporated masterfully. A definite session beer. Not one that you want to have in a series of other beers. Just finish the whole 6-pack. You won’t go wrong.